Oh, I love caramel apples. Considering the number of pieces of caramel, or even those pre-made caramel wraps that you can buy, are only around 150 calories, I think it's well-worth the extra half hour of walking you have to do to burn off those calories (or the 12 oz Dr Pepper you sacrifice) for the yummy treat. Place the unwrapped candies and water in a small to medium sauce pan over medium-low heat. Stir constantly until the candy is melted. Remove from heat. 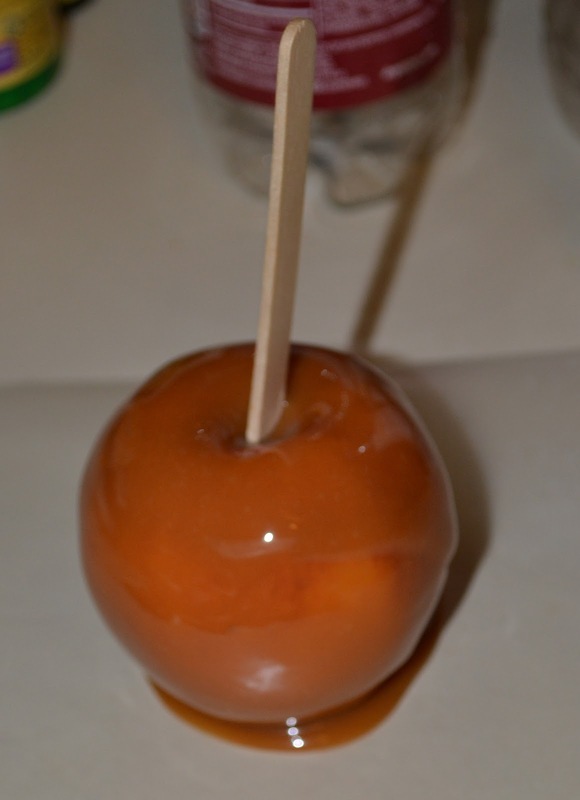 Being careful not to burn yourself, swirl the apples in the melted caramel, making sure to coat all of the apple. Then carefully place the apple onto a buttered section of the parchment paper. Repeat these last two steps until all the apples are coated. If there is any left over caramel sauce in the pan, feel free to drizzle it over some yummy vanilla ice cream, or simply add a little more to the tops of the apples. Place the apples in the refrigerator for a few hours or overnight until the caramel cools. I do love me some caramel apples. Here's hoping your Christmas (if you celebrate it) was Merry and your New Year is very, very Happy!